We've been having fun celebrating the arrival of fall with tons of fall activities the past few weeks. We were feeling art-y, so I thought I'd try out an idea I had for a watercolor resist project with a fall leaf theme. S and I love how it turned out! To start, have your child lay out fall leaves (real or fake) on a sheet of watercolor paper however they'd like. S went for total coverage on her sheet. Then have an adult (or if you have an older or highly skilled child, they could do this part - it was too difficult for S though) trace the outline of the leaves with a light colored pencil (I used yellow). Then have an adult use a hot glue gun to lay glue down along the outline of the leaves. 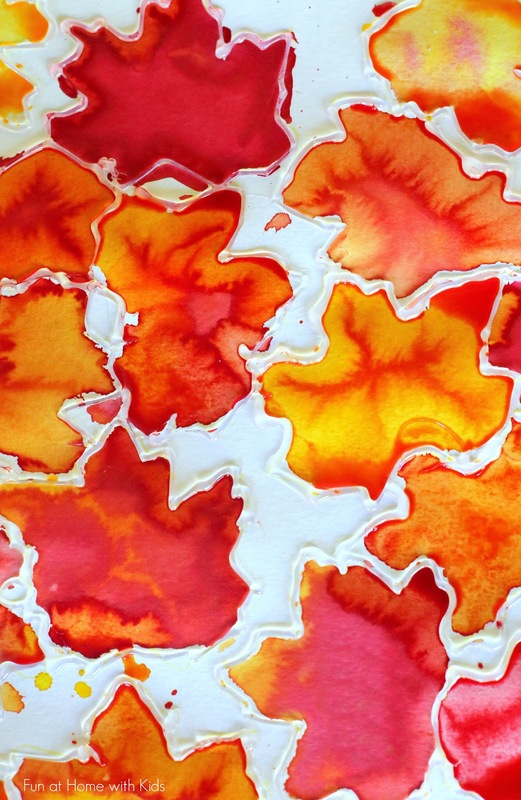 It should be cool to the touch within a few minutes, so you can then present it to your child with some fall colored liquid watercolors (you can substitute food coloring and water if you don't have liquid watercolors) and have them paint away. Though I'd anticipated that S would paint everywhere all at once, she really loved the idea of using the hot glue as an edge and carefully painted in individual leaves. She varied her colors and techinque and it was cool to see how accurately she ended up depicting some of the colors we find in our neighborhood fall leaves! Once your child is done, it will take several hours of laying flat for the watercolors to become dry to the touch. Once dry, you will have a beautiful work of fall art for displaying or gifting! Hi Asla, this is so cool & creative idea. Aww, thank you Ana! I will be sure to pass your compliment on to the artist! These turned out so beautiful! This is absolutely gorgeous - will definitely be trying this! Beautiful as always! Great idea, and I love what she did with it! That's beautiful! Do you leave the glue on, or peel it off after the paint is dry? We leave it on, but you might be able to peel it off - though I'm not sure if it would tear the paper...maybe it'd be OK if you went really slowly? Очень здорово! Попробую повторить с учениками! Te felicito ! una idea maravillosa!!! te invito a ver mi blog!!! Hermoso! Usted es un maestro maravilloso!